"This wonderful recipe is a family favorite of ours - and we have 3 very young children! Everyone who enjoys this recipe always asks what restaurant we ordered it from! It is fast and simple to make. I would say it's a bit like a stir fry with a Thai flavor! Serve on top of cooked brown or classic white rice. Very good with a simple side like mandarin oranges to complete this meal"
There’s nothing more comforting than a warm bowl of this peanut curry chicken. 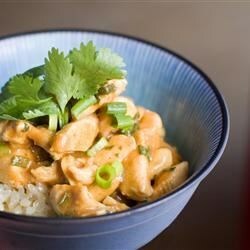 This recipe is full of flavor, but I would definitely agree with doubling (if not tripling!) the sauce measurements, especially if you're thinking of serving this dish with rice or noodles. It takes a while to chop everything up, but after that it is easy to make. And it is well worth the work.